Captiva Beachfront Home in the Heart of the Village. 18 Urchin Court is a Sunset Captiva home, close to the beach, with 450 feet of private beach on the Gulf and private docks on the bay side. Experience tropical island ambiance in our 2,000 sq. ft. home situated within a private gulf front community, which includes heated pool, tennis courts, and BBQ grills. Enjoy spectacular sunsets and great shelling. Behold the nesting and hatching of the protected Loggerhead turtles on the beach and observe the dolphins and endangered manatees along the shoreline. Our home is located in the village of Captiva. Just steps away you’ll find an array of restaurants, shopping, galleries, library, bike and boat rentals, charter fishing and exploration expeditions. Even attend worship services next door at the renowned Chapel by the Sea. We have remodeled our home with new furniture and fixtures, new maple wood flooring and carpeting, appliances, linens, artwork, etc. The great room, which includes a vaulted ceiling, marble-hearthed fireplace, leather sofas and entertainment armoire, is open to the dining room appointed with a large glass topped pedestal table with seating for six. For convenience light meals can be taken at the adjacent snack bar. Eighteen feet of moveable window walls open to an 9’ x 30’ screened private lanai with seating for nine. The new modern kitchen is very open and offers ready access to the lanai. A tropical-themed bedroom with two twin beds and a sunny yellow full-bath complete the main floor. The upper level includes a newly-appointed master bedroom (king sized bed) with walk in shower. The upper loft provides seating for cozy reading as well as sleeping for two in a queen-sized sleeper sofa. The bedroom and loft access an upper level sun deck on which to sun bathe or view the celestial nighttime skies. Fully equipped newer kitchen (refrigerator with ice maker, above range microwave, convection oven, dishwasher, dishes, bake ware, and utensils). Washer / dryer, all bed, bath linens, towels. Two cable TV’s (one in great room and master bedroom). Covered parking is provided under this 'Olde Florida' styled home. Out of respect for our guests, no pets or smoking are allowed. By renting at Sunset Captiva, you will have access to the private community pool and tennis courts that are just steps away. While a guest in Sunset Captiva, you can enjoy the Pine Island Sound bayside wildlife amenities, as well, from the comfort of private docks. Manatees and dolphins are frequently sighted in the bay. Additionally, boat slips are available on site. 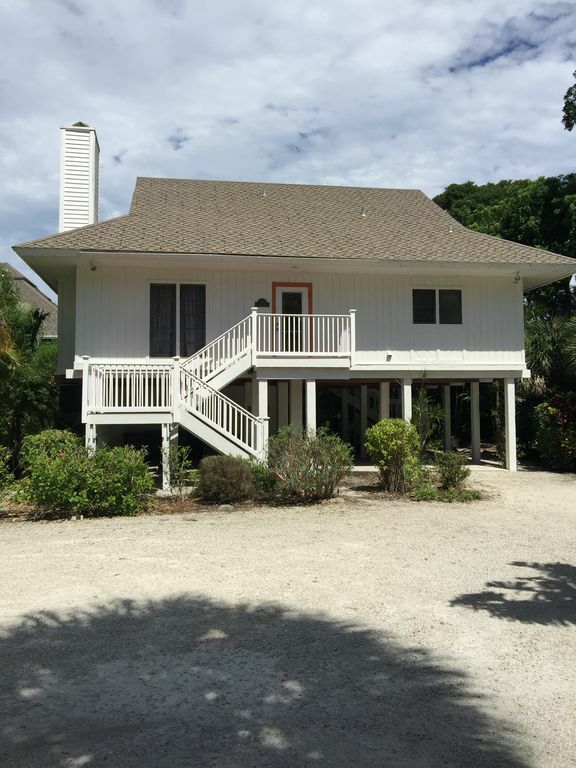 BR B Area: /B BR Within the village of Captiva you will find shopping, restaurants and a small general store. Kayaking, canoe rental, charter fishing and site-seeing excursions are available. Master bedroom includes LCD flat panel TV / DVD combo. This house is in a great community with a salt water pool, tennis courts and a board walk to the beach. It is a short walk to the villiage with a few restaurants, some with outdoor eating and live music. There is also a general store with a fresh fish market on certain days. The house is comfortable with nice appliances in the kitchen and comfortable furniture. Although the weather was a bit cool, there were a couple of days where we could enjoy the screened in porch. Nice area. Condo is adequate, considering most time is spent outdoors. Definitely feels like a rental, but it’s okay being ur is a rental. The property manager is absolutely spectacular with communication, and making sure everything is as good as it possibly can be. The swimming pool and tennis court on the property are in very good and clean condition. The owner finds this review disappointing considering that this guest requested and received an extended stay after arriving (so it must have been fine or better). Also, the home is a private single family home and not a condo. Thank you for allowing us to use your home. It was clean and comfortable, with plenty of space for our family of 4, and everything we needed was there. Communication between us, the owner and American Realty was smooth and easy. Easy walk to the beach on one side, and the private dock on the other side. Excellent restaurants and shopping also within walking distance. Would use again. Thank you! We had a nice week. We loved the house! This property was perfect for 2 adults and 2 teens! The house was clean, comfortable and spacious. It was simply decorated and uncluttered. The kitchen was very clean and large. We spent alot of time out on the screened porch. The community where the house was located was fantastic. The beach was clean and easy to access. Communication with the owner and the management company was spot on! We hope to return to this house! We had a nice stay in this house. Great location, easy walk to beach and restaurants. Kitchen had adequate supplies. Beds were comfortable. The whole area was beautifully landscapes. My only complaint would be a moderate musty odor in the house. Not over powering and it was dealt with by leaving doors open. Other than that we had a nice time. Neither the owner or other guests have noticed any musty odor. Please note that a refundable damage deposit of $200 will be separately charged by us after booking. The deposit will be refunded by us after departure, provided no damages are found. $1650-2650 / Week (Low-High Season) $235-$375/Night (Low-High Season) Low Season rates (Mid-April to Mid-December): $1,650 Peak rates (Mid-December to Mid-April): $2,650 Inquire about discounts for selected dates.